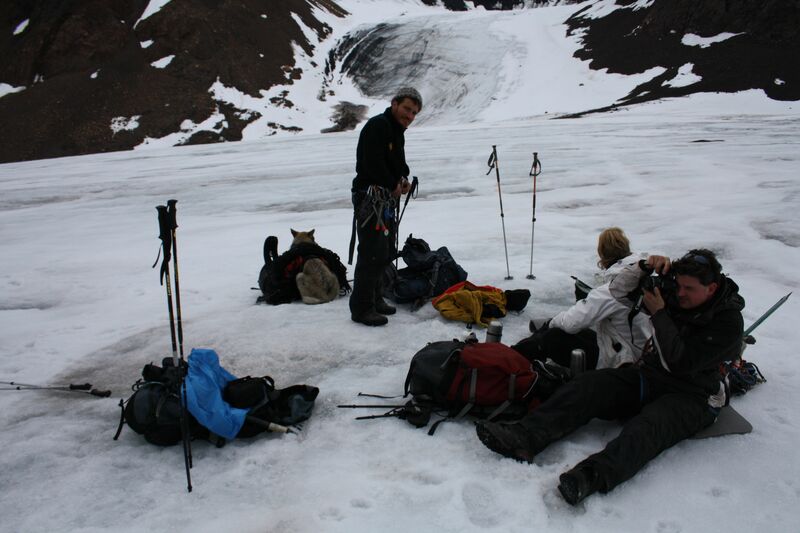 Crampons, harness, ice axe. Ice, snow, water, slush, mud, sinking sands, mossy bog, bouldery slushy bog, moraine, glacial river delta. Amazing glacial vista. Ice wasteland panorama. Desperate ice toilet rush by Steve. Lunch on the ice. Home stretch on the road. Gale. Collapsed tents destroyed by the wind. Two people holding the tent down. Thermarest whipped away like a leaf. Consolidation. Damaged main tent deconstruction. Damaged Lisa tent deconstruction. Massive boulder search to pin down two remaining tents. Tent support strings pulled tight. Zips completely fastened. Dinner in our tent. Solitary and windy bear watch. What a day! Its amazing what enough sleep can do. Our 12 hour night (10 hours sleep and 2 hours bear watch) was wonderful. I am now getting used to the bear watch – waking up in the middle of the night for two hours of self contemplation with a spectacular view. The first night I lay awake for hours expecting to be called to the bear watch any minute. 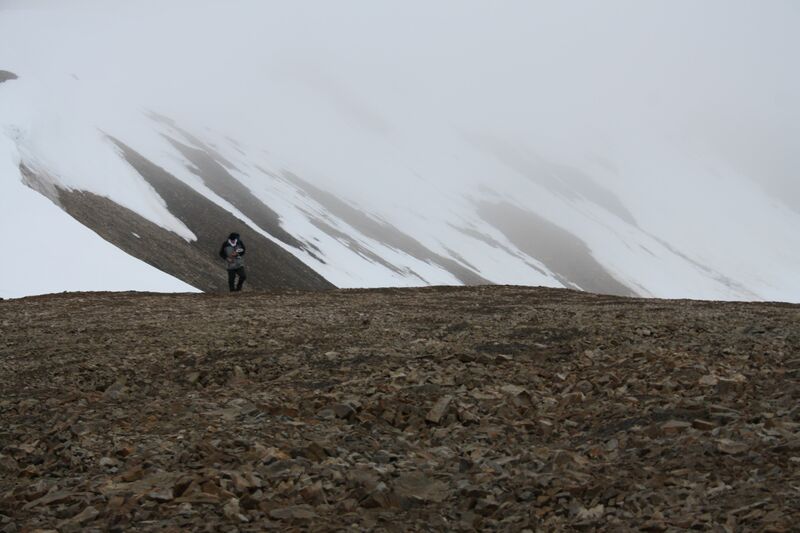 As I had hidden my watch, which, anyway, was not on Svalbard trek time, I could not check the time. Now I sleep like a baby until Lisa calls me out of my slumber. Its amazing what a leisurely breakfast can do. 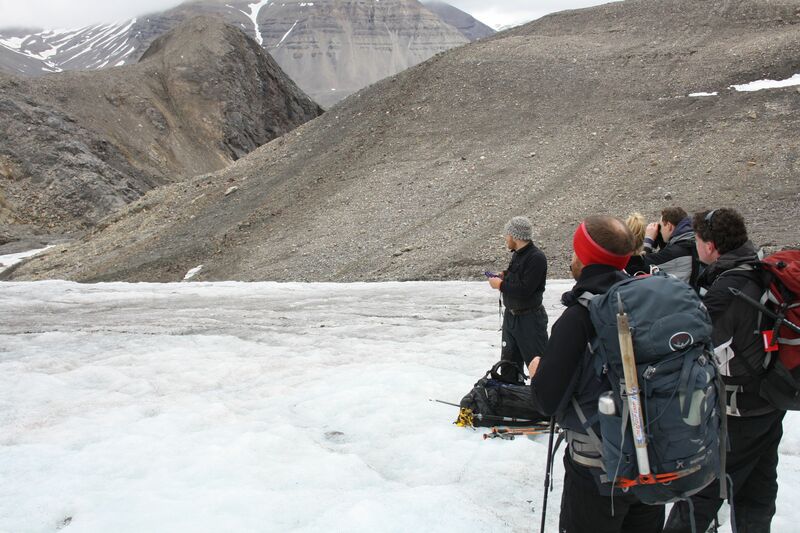 Refreshed and nourished, we are all ready to walk on our first glacier. The walk down the fjord, across the flatlands, is becoming more familiar. Along the road until it fizzles out, and then along the grassy plains. Sometimes, in walking, the mind wanders. I am constantly fascinated with the sun, and how it never sets. I contemplate its trajectory across the sky. The nerdy, mathematical part of me ponders how to calculate a formula for its path. 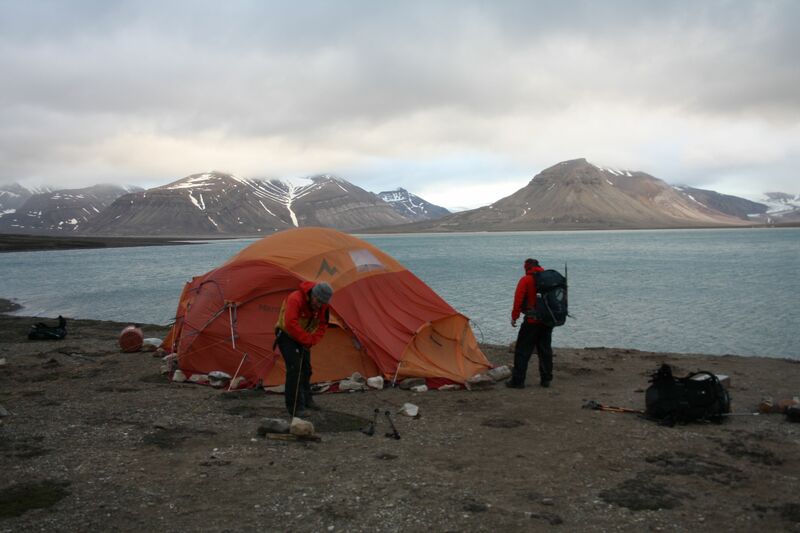 Over the whole Svalbard holiday, I will spend hours of bear watch time trying to calculate a formula for its path. The sun is always above the horizon and reaches its highest point in the south. 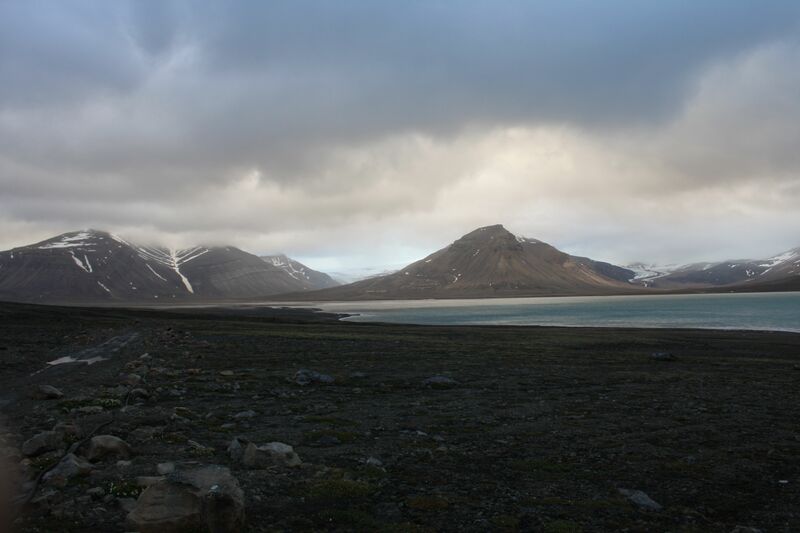 In the north it is slightly lower, parting less light and warmth on the arctic landscape. The beautiful arctic compass flower which we pass every day on the plains brings my thoughts back to the sun and its arctic behaviour every time. 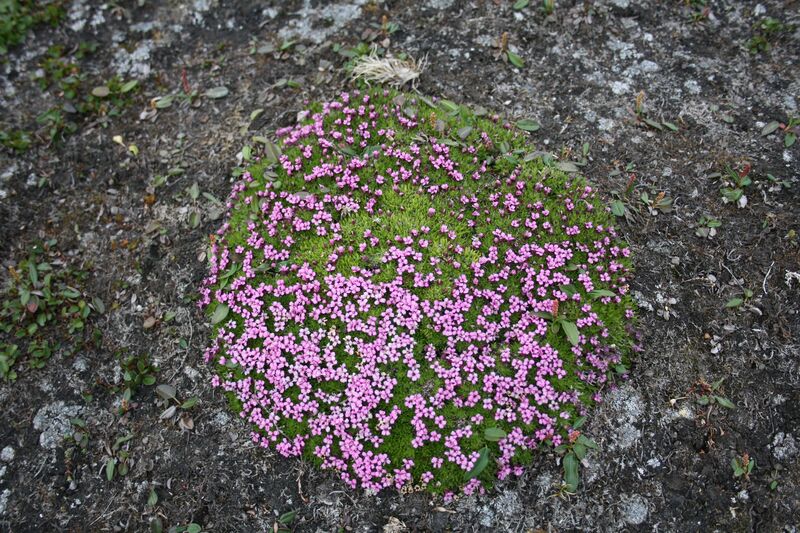 It is a tuft of green with purple flowers. This beautiful flower indicates south like a compass. The density of flowers is higher on the southern side of the tuft. Amazing. Beautiful. The beautiful arctic compass. A tuft of green, and purple flowers. They are more dense on the southern side of the tuft. Fascinating. The arctic. 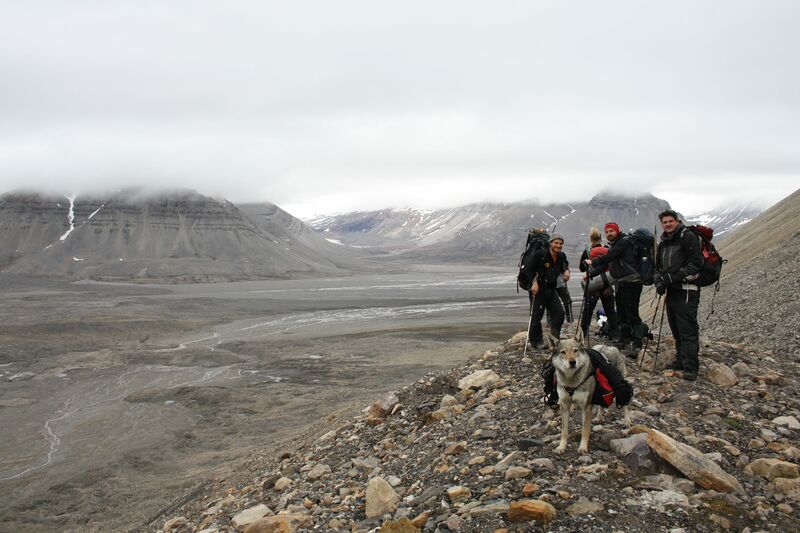 Then we leave the plains and make a short, steep grunt up a moraine to the base of a glacier. The top of the moraine. At the bottom of the glacier. 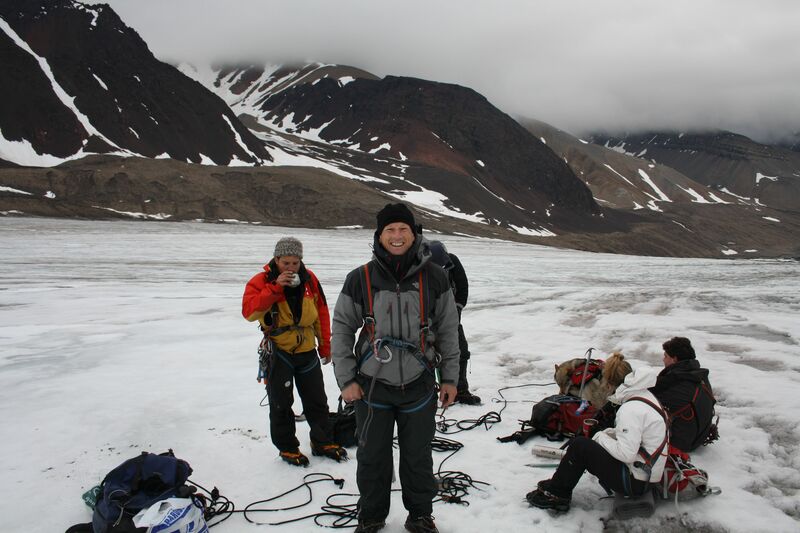 On the glacier we are tethered together. We are now masters at tying a variety of knots fastening our harnesses, and connecting ourselves to the rope. This rope is our lifeline if we fall into a crevice. Once fastened, we must keep the line taught. This means we all walk 8 metres from the person in front, and 8 metres from the person behind. It also means that everyone needs to walk at the same speed. This not easy. 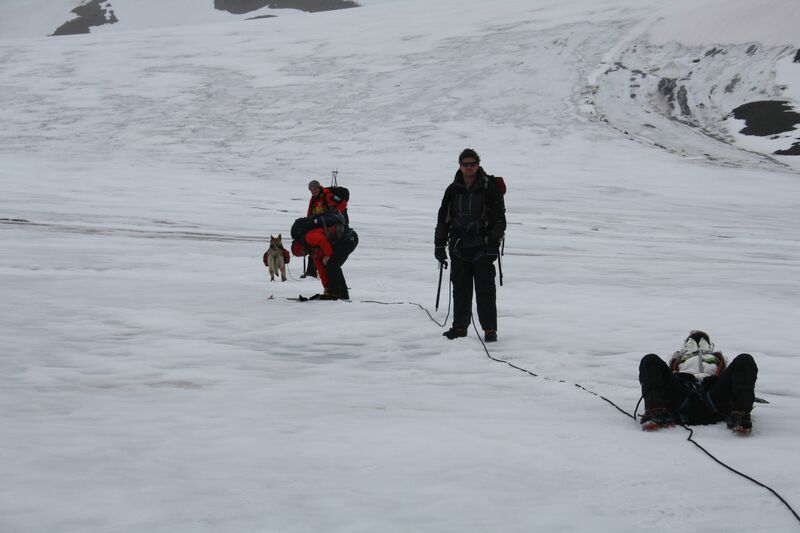 A sludgy patch is harder to walk on than a hard, icy patch (as we are wearing crampons). Jumping over a minor steam on the glacier needs preparing the footing before a leap. Sometimes the rope was a concertina. 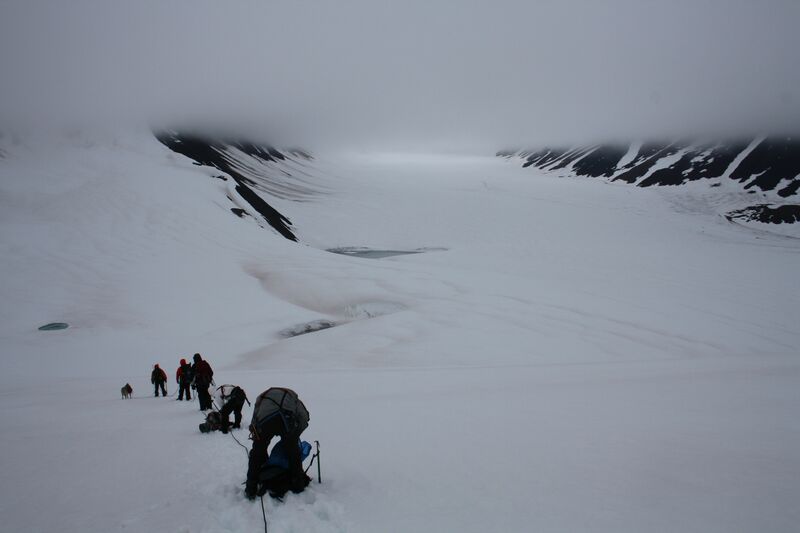 Rising above the glacier, we walked on the sludgy snow up and up towards a pass. Distances are deceptive here. What looks like 100 metres takes an hour to walk. The crest is always just 100 metres away. And stays that way even after walking a kilometre. Things were getting desperate for Steve. The crest (and thus the rest) remained 100 metres away. When we finally reached the crest, Steve took the toilet paper and darted off for a very windy and icy toilet break. The view over the ridge was awesome! A panorama of ice and snow lay below us. Little lakes of ice broke up the white. The ice was surrounded by brown mountains rising up into the clouds. It was truly breathtaking. As we got lower the snow became sludgier, and it was like walking in a slush puppy, every step sinking to the ankles, through the layer of snow into icy water. We continued on until we found a patch of firmer ground. It had been an amazing hike. Everyone spirits were buoyed by the beauty of the rugged icy nature. And then, yet again, we were reminded of the bane of the glacier. The moraine. 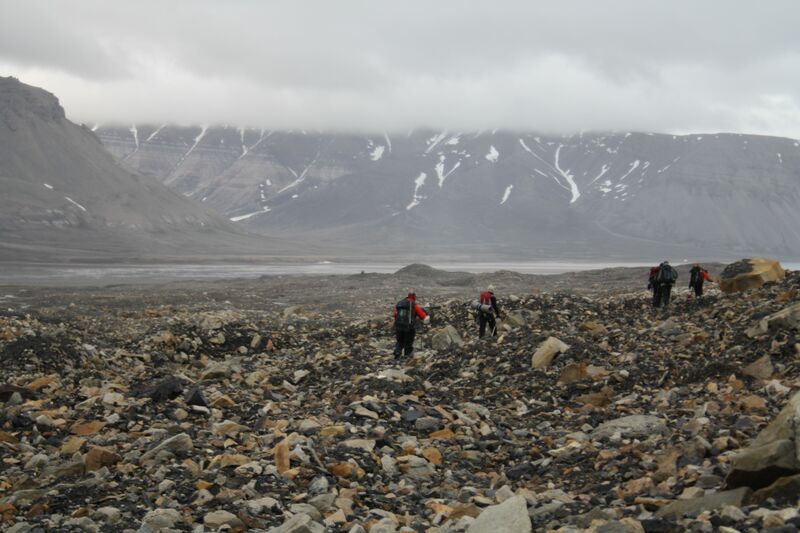 And this glacier’s moraine was huge, rocky, sludgy with patches of quick sand. The wind was picking up, and it started to rain. And the moraine went on and on and on. It was a scrambly, tiring affair. We climbed the last ridge of the moraine, and were nearly blown off our feet. Our trudge across the plains was in strong winds and fine misty rain. We didn’t have our stream crossing footwear, and so were polevaulting across the little streams to try to keep our feet dry. And then we discovered a stretch of mossy bog in which we sank up to our shins in water. Bye bye dry feet. We finally made it to the road. I was walking with Lisa, and the others scooted away much faster than we could walk. I think Steve was up for another toilet break. But, then I had to stop for the clouds. They were beautiful. And the mountains opposite on the other side of the fjord were bathed in an amazing light. Lisa and I arrived back at the camp a few minutes after the others. The wind was brutal. There was frantic activity at the campsite. The main tent was being destroyed by the wind. It had caved in. I was immediately called to action. Ben and I both held the tent down, grasping on to the main pole. I was on the outside of the tent and Ben on the inside in order to prevent the pole from snapping and the tent from being blown away. Not a second to catch our breath. 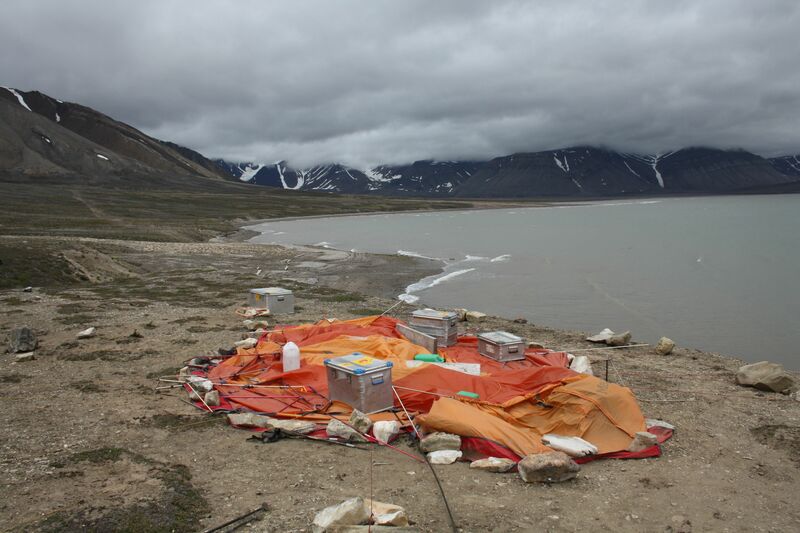 Sam was emptying the tent in order to then bring it down, so it couldn’t be further damaged by the wind. He left the tent with his thermarest, and, in a sudden extra gust of wind, it was pulled from his hands. Within a blink of an eye it was metres in the air, and being tossed in the wind like a leaf, being blown down the fjord at amazing speed. Sam sprinted down the fjord like an olympic sprinter in heavy hiking boots, and within seconds he was hundreds of metres away. Several times he almost snatched the thermarest from the air, but, each time, the thermarest jumped away. Then, it rose and rose and rose. Perhaps 50 metres high, and much further down the fjord. The thermarest was lost. The main tent was dismantled. Lisa’s tent, whose main pole had snapped, was dismantled. 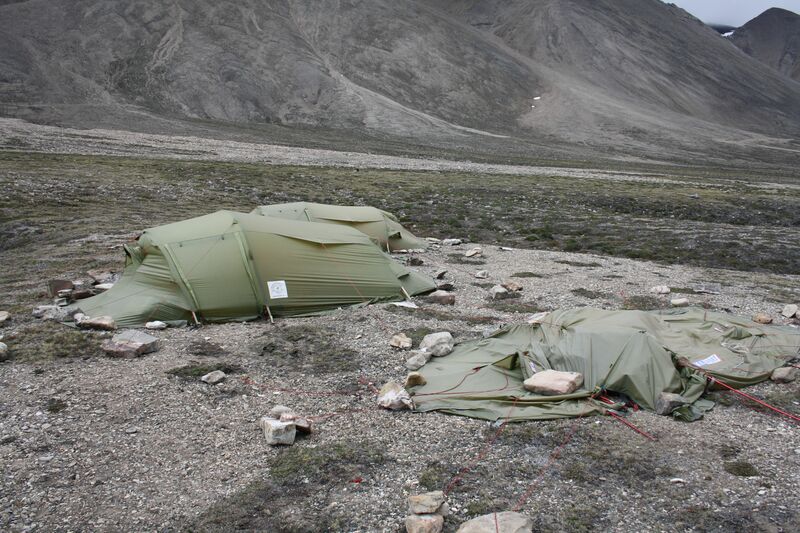 The remaining two tents were consolidated. We all had to scour the area for huge boulders. We could feel the wind. We knew what boulders we needed. Big ones. And we needed them fast. Half an hour later the tents were consolidated, and we could rest. No fancy dinner tonight. We all had Drytech dinners in our tent, listening to the gail outside. Bear watch was a lonely bleak affair. Slowly the wind died down. By the morning it had changed direction. But, it was nothing to what it was. Today we have experienced the ferocity of the arctic weather. This is also why I wanted to come here. Experience the arctic. I am certainly doing that!